Country house Ulaca is located on the north side of Sierra of Gredos. It has been classified as one of the best accommodations in the province. It is situated in the nice locality of Villaviciosa and just 20 kilometres away from the city of Avila. 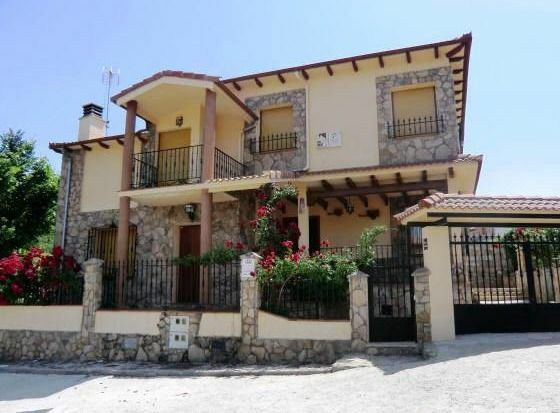 This country house offers you a lovely view of the Sierra and the Castle Sancho de Estrada. The surroundings will please those who love peace and calm and the country life. Country House Ulaca offers four rooms with country furniture and cheerful colours, two bathrooms and one confortable and wide toilet. Our house is also provided with a living room, including a fireplace, and a completely equipped kitchen. Furthermore you can enjoy the barbecue and the wood oven both placed in the back porch, where you can elaborate your own bread and other food. Besides there is a little farm with different types of ecological vegetables (during July, August and September). You will enjoy walking around the Celtic castro Ulaca, the Castro Vetton of and the most interesting celtic fortified city of Europe. Besides you will also find lots of marvellous water sources during the walks. Medieval festivals that are of special interest for visitors take place during the second half of August. Guests of Ulaca country house will get free access to the municipal swimming pool, during the hot summer months. During the winter time the snow will make you feel even more homely and cosy next to the fireplace. Es una casa ideal para amigos con ganas de aire puro y hacer barbacoas en la terraza.El trato con los propietarios es excepcional y su huerta está a tu disposición,y siempre con un ágape de bienvenida.Es una casa para repetir como ya hemos hecho y recomendada a amigos.